(1) The coast route, known as "the way of the land of the Philistines" (Ex. xiii. 17), running through Gaza, Ashdod, Dor, Accho, and Tyre. At the last-named city this road took a sharp curve inland to Dan and thence ran to Damascus. (2) The route which branched off from the first at Ashdod and, skirting the foot of the Shefelah, went to Antipatris and Accho, while a branch line from Cæsarea crossed it and ran to Cana, Tiberias, and thence to Damascus. 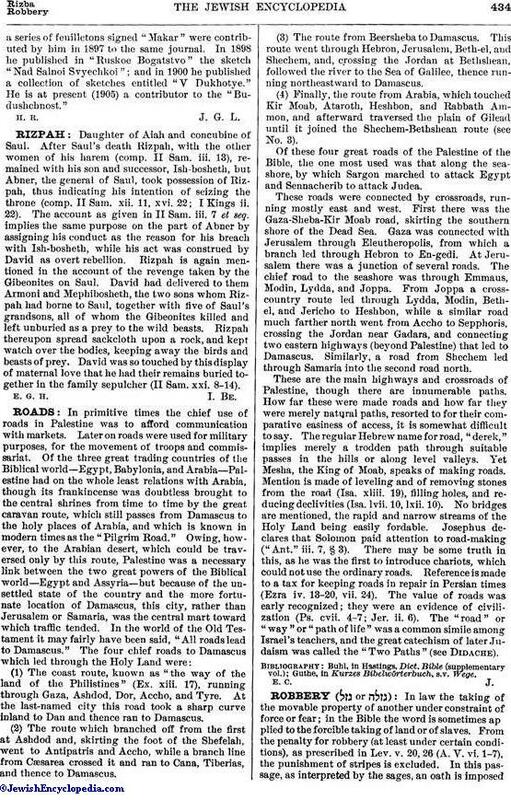 (3) The route from Beersheba to Damascus. This route went through Hebron, Jerusalem, Beth-el, and Shechem, and, crossing the Jordan at Bethshean, followed the river to the Sea of Galilee, thence running northeastward to Damascus. (4) Finally, the route from Arabia, which touched Kir Moab, Ataroth, Heshbon, and Rabbath Ammon, and afterward traversed the plain of Gilead until it joined the Shechem-Bethshean route (see No. 3). Of these four great roads of the Palestine of the Bible, the one most used was that along the sea-shore, by which Sargon marched to attack Egypt and Sennacherib to attack Judea. These roads were connected by crossroads, running mostly east and west. First there was the Gaza-Sheba-Kir Moab road, skirting the southern shore of the Dead Sea. Gaza was connected with Jerusalem through Eleutheropolis, from which a branch led through Hebron to En-gedi. At Jerusalem there was a junction of several roads. The chief road to the seashore was through Emmaus, Modin, Lydda, and Joppa. From Joppa a cross-country route led through Lydda, Modin, Bethel, and Jericho to Heshbon, while a similar road much farther north went from Accho to Sepphoris, crossing the Jordan near Gadara, and connecting two eastern highways (beyond Palestine) that led to Damascus. Similarly, a road from Shechem led through Samaria into the second road north. These are the main highways and crossroads of Palestine, though there are innumerable paths. How far these were made roads and how far they were merely natural paths, resorted to for their comparative easiness of access, it is somewhat difficult to say. The regular Hebrew name for road, "derek," implies merely a trodden path through suitable passes in the hills or along level valleys. Yet Mesha, the King of Moab, speaks of making roads. Mention is made of leveling and of removing stones from the road (Isa. xliii. 19), filling holes, and reducing declivities (Isa. lvii. 10, lxii. 10). No bridges are mentioned, the rapid and narrow streams of the Holy Land being easily fordable. Josephus declares that Solomon paid attention to road-making ("Ant." iii. 7, § 3). There may be some truth in this, as he was the first to introduce chariots, which could not use the ordinary roads. Reference is made to a tax for keeping roads in repair in Persian times (Ezra iv. 13-20, vii. 24). The value of roads was early recognized; they were an evidence of civilization (Ps. cvii. 4-7; Jer. ii. 6). The "road" or "way" or "path of life" was a common simile among Israel's teachers, and the great catechism of later Judaism was called the "Two Paths" (see Didache). Guthe, in Kurzes Bibelwörterbuch, s.v. Wege.